Robin - Carte des deux Florides et de la Louisiane inférieure : dressee pour les voyages de Mr. Robin dans les annees 1802, 1803, 1804, 1805 et 1806. . .
Robin, Abbe´, 1750-1794. 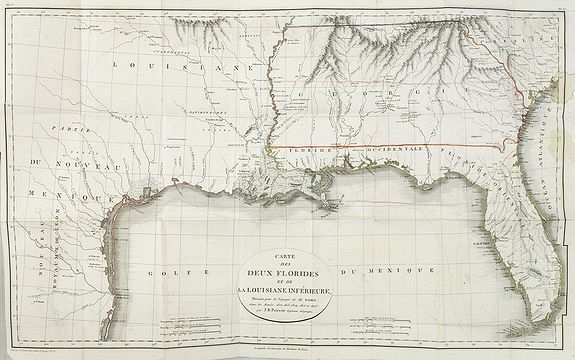 - Carte des deux Florides et de la Louisiane inférieure : dressee pour les voyages de Mr. Robin dans les annees 1802, 1803, 1804, 1805 et 1806. . .
Carte des deux Florides et de la Louisiane inférieure : dressee pour les voyages de Mr. Robin dans les annees 1802, 1803, 1804, 1805 et 1806. . . - Robin, Abbe´, 1750-1794. Title : Carte des deux Florides et de la Louisiane inférieure : dressee pour les voyages de Mr. Robin dans les annees 1802, 1803, 1804, 1805 et 1806. . ..
Map maker : Robin, Abbe´, 1750-1794.. Date : Paris, F. Buisson,1807. Size : 16.1 x 26.2 inches. / 40.8 x 66.6 cm. Description :Very detailed map by J.B. Poirson, which shows all of Florida and Georgia, Louisiana north to Arkansas with the Ozarks clearly delineated, and east Texas with its rivers in some detail. Jean-Baptiste Poirson was a French cartographer active between 1798 and 1820. He issued series of maps of France and of its colonies. Repair of small tear 3cm. Into left hand part of the map. Bound in : "Voyages dans l'intérieur de la Louisiane : de la Floride occidentale, et dans les isles de la Martinique. . ." Two volumes of three. ,xii,346; ,511pp. plus folding map. Frontispiece portrait in first volume. Half title in each volume. Contemp. half calf. An important narrative of travel in the Caribbean, Louisiana, and West Florida. The first volume describes the author's voyages and his visits to Martinique and St. Domingo, ending with his arrival at Pensacola in 1803. In the second volume he gives an account of his stay in Pensacola and journey to New Orleans, which he describes in great detail. He was present at ceremonies turning Louisiana over to the United States both in New Orleans and in Natchitoches. He spent considerable time exploring in western Louisiana and gives an excellent account of the country, its natural history, the crops and agriculture of Louisiana, the French inhabitants of the area, and the climate. He also discusses the limits of Louisiana, the problems of the border with Spain, the new American government of Louisiana, and other civil and political questions. "He gives a most ample description of Louisiana's western interior and of Spanish Texas"
Charles César Robin's "Voyages dans l'intérieur de la Louisiane" was published in 1807. The following year Robin wrote to Napoleon, then emperor, urging him to occupy Florida, which he believed could serve as a base for a renewed French American empire. !